Lunch never happened. I got busy cleaning and sorting things, and working on sites. I had a late afternoon snack of Michelob Ultra (low carb) beer and almonds. For dinner, I made Cincinnati chili over spaghetti squash. I can never quite get over how good that tastes and how little I miss spaghetti. The chili, cheese and onions simply need a pasta-like base and spaghetti squash does the trick. I finally made the dessert I planned to make on Thanksgiving. Pumpkin cream cheese dessert. I used this recipe as a base, but changed it up a bit. Who needs crust? I mixed cream cheese, spices, sweetener, and pumpkin and portioned it out into a muffin panned lined with foil cupcake liners. The entire recipe was about 40 carbs and it garnered 12 cupcakes, so they were just under 4 g. a piece. I baked them at 350 for about 25 mins and topped with about a tbsp of Reddiwhip after they were chilled. Yesterday was hump day. I awoke feeling pretty bad about the unplanned carb meal from the night before. Then I put on my pants…they are looser! What is it about this illogical event that happens when I eat carbs? Afterwards, I seem to lose more pounds that week, or my clothes are looser. Rick says my stomach inflates and stretched out my pants, then the next morning it deflates and the pants are now bigger. Thanks, honey. Except, I don’t put on the same pants on the second day. They are fresh from the laundry. Nice try, tho! So, off to work I went, puzzled but happy. 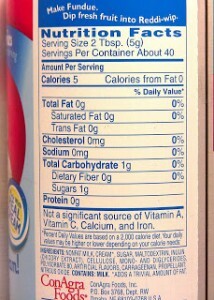 I started the day with a low-carb yogurt. For lunch, I had a “blt” – low carb tortilla, 1/2 roma tomato, spinach leaves, and 5 pieces of overcooked bacon (just the way I like it!). Delayed dinner…when I got home from work, I was dead tired, so I took a 15-minute nap. I’ve been a little more tired this week than usual. I think it may be depression due to my dad’s death. Anyway, I took the nap, then got up and went right to work on our company website. We’ve revamped it and have been about 90% done for months. Life, death, new clients, and home remodeling overtook the project. However, I want to do an advertising mailing, and the postcards are waiting to go out until the new site is up. Time to take the bull by the horns and get ‘er done! I worked on it for hours. I worked through the hunger, so when I finally uploaded the site, it was about 9:30 and I wasn’t hungry at all! I decided to sit on the deck and have a celebration/relaxation drink. I had vodka on the rocks with a twist of lemon. Never had it before, and I forgot to check the carbs in the juice of one lemon. I’ll do that later today. After about 1/2 hour, I decided I had better eat. Starvation is not good for weight loss. I found a small portion of leftover Cincinnati chili (when was it from? don’t want to know) put it on top of 1 cup of leftover spaghetti squash, topped it with onions and grated cheese and enjoyed a quick meal. 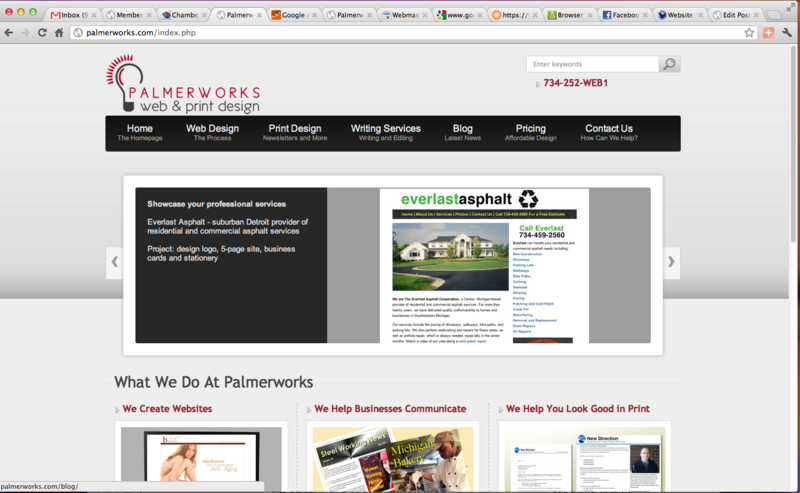 Then I went back to work, checking links on the new site before bedtime. Oh, and of course, I had 2 squares of 70% chocolate bar topped with natural peanut butter. Yesterday was the last day at work for my friend Chris, the IT guy at work. He is off for greener pastures, and the boss threw had a goodbye lunch at Red Lobster. Before going to lunch, I had a breakfast yogurt. I didn’t want to go into the den of temptation ravenous. My best accomplishment? Ignoring the cheesy biscuits. I LOVE LOVE LOVE the Red Lobster cheesy biscuit. Which reminds me, I have some Carbquik and should work on perfecting that fake biscuit recipe some more. But I digress. We had a lobster pizza appetizer, so I ate the top off of my piece. I ordered the shrimp scampi with a side of broccoli. Do I have a halo, or what? Normally, I order the Walt’s fried shrimp with garlic mashed potatoes and unlimited CBs. This time I ate sparingly and had a little Caesar salad with my meal. I really am not craving the carbs, and it really wasn’t that difficult to eat keto-friendly choices. After work, we stopped by to see my dad, but he was sleeping. I’m always disappointed when I don’t get to talk to him. We then set off for the Home Depot. We stocked up on the rest of the supplies we need to finish up the house for sale, then headed home for dinner. I made another successful spaghetti squash and we had Cincinnati chili leftovers. The meal was just as good as the day before. Tuesday morning started with a tasty low carb banana cream pie yogurt. The boss bought pizza for everyone for lunch, so I had the toppings off of three pieces and a healthy salad. After work, we worked on the house, put down some more molding and a couple of thresholds, then called it a day. I decided to make Cincinnati chili over spaghetti squash, since I hadn’t had it in awhile. 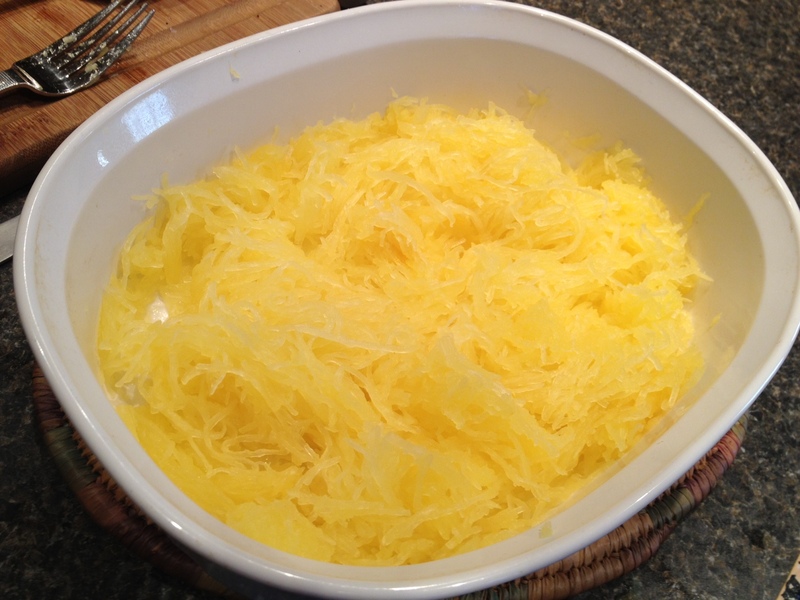 The sauce was simmering and it was time to start cooking that difficult spaghetti squash. Half the time, it’s so tough that I can’t cut into it. Other times, it takes a really long time to cook, and one time, it blew up in the microwave. 1. 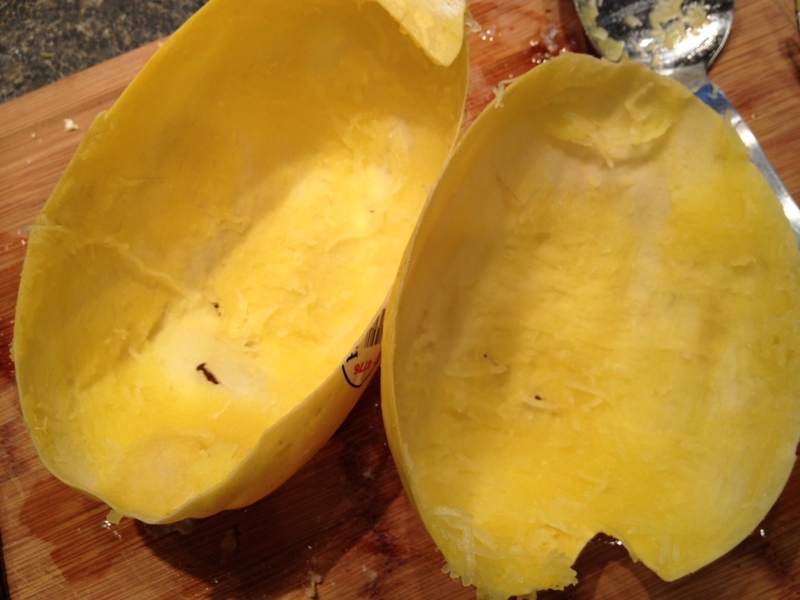 Stab the squash with a fork about 10 times in various places. 2. Put it in the microwave for 6 minutes. 3. Take it out and find it is still hard. 4.Nuke it for another 6 minutes. I portioned some out for Rick and myself, topped it with Cincinnati chili, onions, grated cheese, and soy black beans. Yum de yum yum! And plenty of Chili leftover for tomorrow. Yesterday was non-eventful. The day began with a trip to the dentist for some new fillings. Once I got to work (and my mouth was no longer number) I ate my delish “McRick” meal breakfast. Lunch was 2 warmed up hotdogs in Cincinnati chili sauce. Snack was 28 chili/lime almonds. Dinner was at trivia (Albert’s in Garden City). I ordered the grilled chicken salad. It was huge and topped with shredded cheese, bacon, onions, and cherry tomatoes [which I donated to others]. It was a huge salad and very filling. It had lots of grilled chicken. After trivia, Rick and I watched some TV and had our chocolate mousse dessert. Not weighing daily is somewhat anticlimactic. Hoping that Saturday’s weigh in makes it worth the wait. I had another relaxing Sunday, yet accomplished a lot. Breakfast was at home. I ate the leftover pizza from last night while doing the NYT Sunday puzzle. Lunch was piecemeal. I had a handful of almonds while I worked on websites. I did some laundry, cleaned the kitchen, and by then it was time to go tile the floor at the rental house. I grabbed the leftover 1/4 dish of Cincinnati chili and warmed it up when I got there. It wasn’t enough to call lunch, but it held me over until dinner. Brandon made crackers from a recipe I found yesterday. They weren’t very good, but the jalapeno yogurt dip tasted very good on top. I guess we’ll all stick to bbq pork rinds to use for dipping. 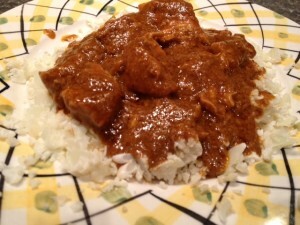 For dinner, I decided to try to cook the Indian Butter chicken correctly this time. I microwaved it for 22 minutes on medium power, and it turned out well. I took a new picture of the way it is supposed to look, not dried up like my last venture. I cooked a half a head of grated cauliflower in the microwave and served the butter chicken over the top. I certainly have eaten more cauliflower than I ever have in my life. I had mousse for dessert. It felt odd not to weigh myself this morning, but I am definitely going to hold out until next Saturday. I decided to give it a rest. I’m tired of watching 1/2 pound come and go every day. Let’s see if I can see a significant loss in a week. Fingers crossed. Yesterday was Valentine’s Day. The day began with my egg breakfast. Lunch was Cincinnati chili. Snack: almonds. For dinner, Rick and I decided not to cave to the Hallmark holiday pressure. He said he didn’t buy me chocolates, because why bother? We really don’t like crowds, so eating out didn’t appeal. And with Netflix at home on our big screen tv, who needs the movies on a traditional big date night? We opted to have grilled steaks and watch a movie at home. Being in a really festive mood, I had a big glass of vodka and Diet Coke (ZERO carb drink! ), and we played 3 Boggle matches while waiting for the steaks to cook. In all modesty, I won’t say who won, but they were all close matches. We each had 2 great big grilled portobello mushrooms with our steaks, and they were a really delicious accompaniment. I didn’t miss potatoes or any other high-carb side dish. Although for about 10 seconds, I fleetingly pictured enjoying some bread and oil with the meal. It must have been the vodka messing with my inhibitions! I’m still not used to see only 1 or 2 carbs after entering a huge meal into myfitnesspal.com. A big steak, 2 mushrooms and dessert hardly moved the numbers, but I was very full and very satisfied. I’m sure glad I planned ahead Sunday, because yesterday I had no time to cook. Breakfast – eggs/sausage/cheese in a bowl. We had two long meetings at work, so I didn’t get a chance to eat until 11 a.m.
We had a print deadline at work, so I stayed at my desk until 8:30 p.m. At around 4, I started getting hungry, and lo and behold, I had leftover Cincinnati chili. Actually, it wasn’t leftover, since I hadn’t eaten any since I made the batch in preparation for the week. It was a small bowl, but it filled me up so I could keep working. I had some habanero almonds for a snack a couple of hours later. I miss the chili lime. I have to buy some next chance I get. A couple of us were comparing almond prices. Meijers has them in one pound bags for $6. 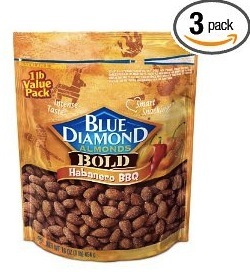 Amazon sells 3 one-pound bags for about $20. Neither tops the 2 for $4 sale they had at Walgreen’s. I hope they have that again soon. The book was finally ready, and I gladly left work at 8:30. By the time I got home, I was pretty hungry. I had another plate of chili over squash at 9:30. Rick and I ate the last of the lime jello “cheesecake” for dessert. I need to find some lavash bread that Brandon let me try today. It’s a huge piece of pita-like bread that only has 8 grams of carbs for one. He made something like a quesadilla with one and it was big enough for a meal. I’ll have to get the name and brand from him and pick up some soon. Zero, zero, zero. Sigh. My plan to start weighing once a week after I hit 15 pounds may have to change. I’ll give it a couple more daily weigh-ins, but if I continue to see no progress on the scale, I may stop weighing for a week or so. Today, I think I’ll drink about 12 glasses of water. I’ve been reading ideas about how to get the pounds to start coming off when the progress is stalled. 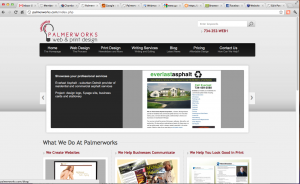 I spent yesterday at home working on client sites and a revamp of our own business site. Before getting started, we did take an hour to have breakfast at the local diner. I had the feta omelet and bacon, and gave Rick all the extras that came with the meal. For lunch, I cooked up some hamburger with taco seasoning and topped it with cheese, onion, and a couple of tablespoons of salsa. I was in the mood for pizza, but didn’t have enough ambition to try creating a crust from cauliflower. Instead, I adapted a recipe I found that used a mini muffin pan. I put a piece of pepperoni in the bottom of each muffin slot, topped with mozzarella and a bit of onion and green pepper. Then I sprinkled them with pizza seasoning and put chopped jalapeno peppers on half. I baked them at 350 for 15 minutes. The original recipe called for cream cheese, eggs, and other items. I think that would have been more like a quiche. The result was just so-so. 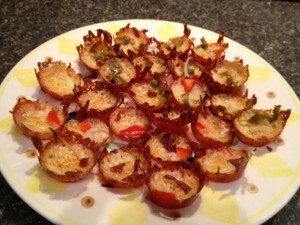 They were tasty, and they were cute little cups, but the jalapeno pizzas were too salty. I ate about 8 of them, but that was the extent of my dinner. I learned my lesson about planning last week. It seemed like I was always looking for a quick meal or having a snack for dinner. While my tiny pizzas were cooking, I prepared spaghetti squash and cooked up some Cincinnati chili. Then, before bed, I layered all the ingredients for a 5-layer chili dish into plastic dishes, so I could grab one for lunch as I left the house this a.m.
Last night’s dessert was something I’ve been meaning to try; however, again, I adapted the recipe to an easier version. 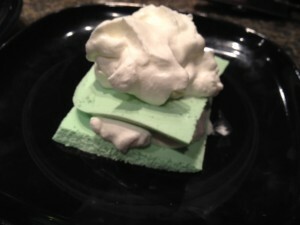 I had found a few recipes that used sugar-free lime jello and cream cheese to make a sort of mock cheese cake. Some called for cooking, some called for crust. I just mixed the jello and cream cheese together and chilled for a couple of hours. Before serving, I topped with whipped heavy cream. It was heavenly. Rick said it hit every one of his taste buds. The flavor of the cream cheese blended well with the lime taste.